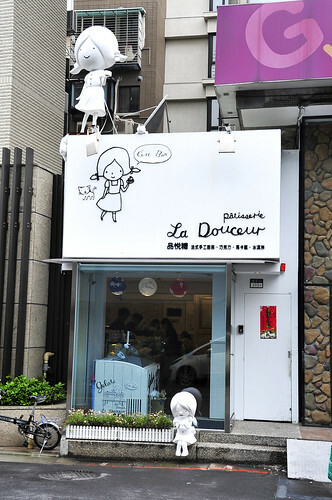 Pâtisserie La Douceur is not located along Yong Kang Street but instead, along 金華街 Jin Hua Street near the other somewhat quieter end of the cluster of small roads, away from the hustling and bustling of street traffic on the main Xin Yi Road. Navigating to this place may require some effort and thus not merely coincidental. We ordered 4 petite gateaux to share and sample. 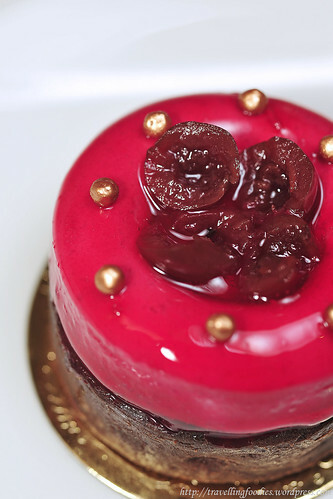 First was a dark chocolate and morello cherry tart called “皇冠” which literally means “Crown”. Well, looking at how it is designed, it is not difficult to imagine why it named so. The composition was both simple and intriguing. 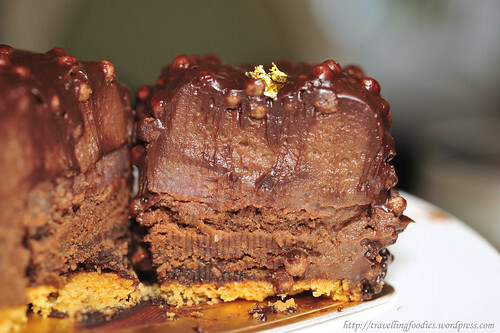 A dark pate sucree aux cocoa based filled dark chocolate ganache. 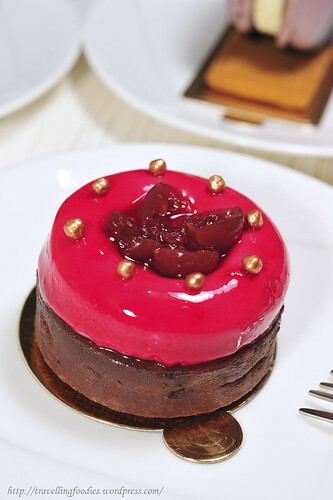 topped with a savarin shaped sour cherry mousse with morello compote in the cavity, it is almost like a forêt noire disguised in a tart. One who enjoys extremities in flavour would probably like this piece. The bitterness from the dark chocolate ganache is well balanced by the acridity from the sour cherry mousee and of course, the sour cherry slices within. 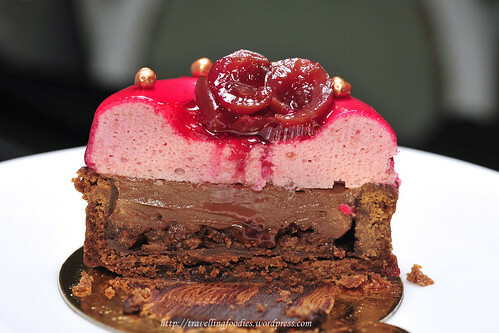 And yet, the richness and velvety textures of the ganache is offset by the delicately light set mousse. Seemingly disagreeable separately, the flavours came together quite well when enjoyed on the whole. 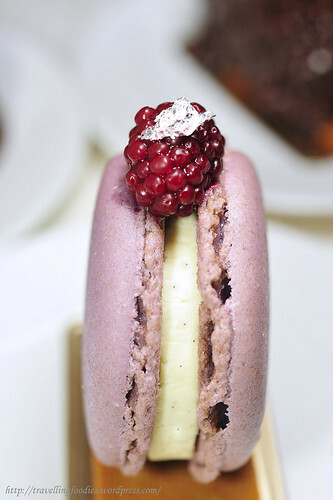 Tahiti 大溪地, a gigantic macaron filled with Tahitian mousseline vanilla cream and a fruits aux rouge gelée in the middle, topped with a lightly macerated blackberry. The whole piece is glued by couverture onto a graham cracker! 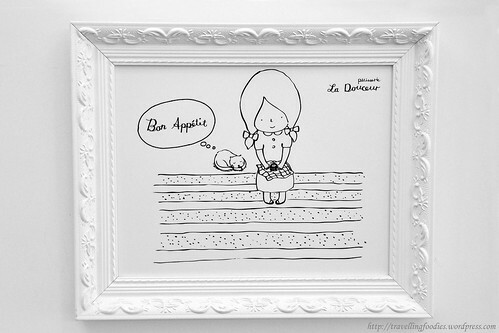 Visually very very stunning, with the macaron shells very well-made. 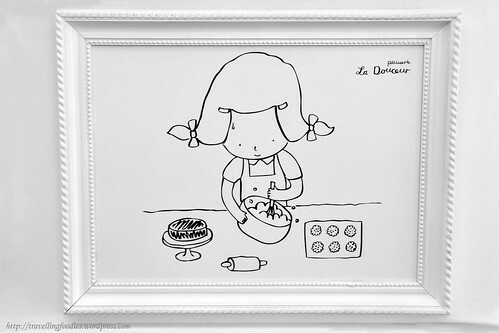 Reminds me of a similarly propped up gigantic macaron I had at Pâtisserie Kanae back in Kyoto. 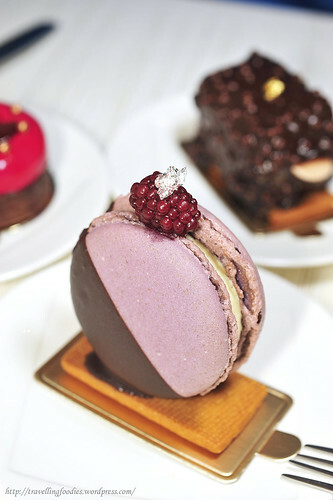 Afterall, how often does one get to enjoy a gigantic macaron like this? 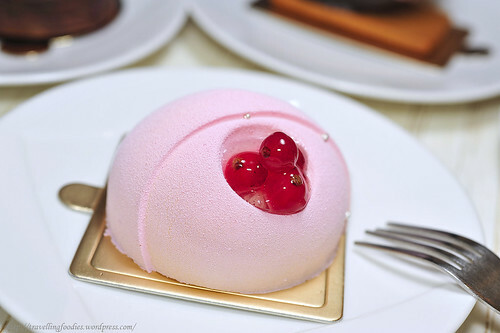 And I dare say that Pâtisserie La Douceur’s Tahiti is better! 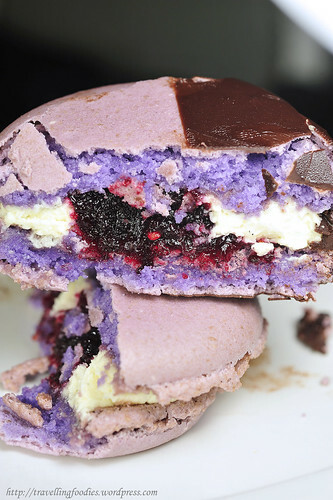 We were initially skeptical if a vanilla mousse cream filling would be too boring and cloying. Yes its made from premium Tahitian vanilla, but still! Thankfully, the heart beared a lovely surprise in the form of a thick slab of gelatinised mixed mashed berries that helped to break any monotony and prevented this piece from ever reaching a point of having too much cream . Despite its size, we’d finished it in quick sucessions, unlike the disaster we’d had of yet another similarly large macaron we had at Paul Lafayet in Hong Kong. The latter was honestly beyond being palatable. For a chocolate piece, we ordered 克劳蒂 Claude, which is essentially a brownie cake disguised as an ice-cream! 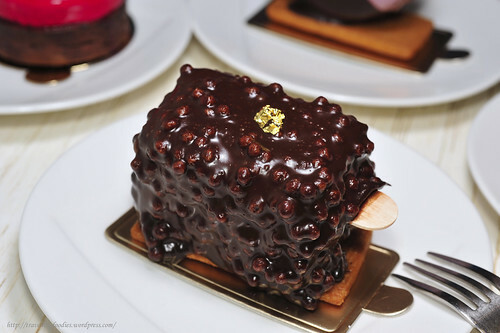 Using 72% chocolat noir from Michel Cluzel, bitterness is one of the overtones highlighted in this piece. 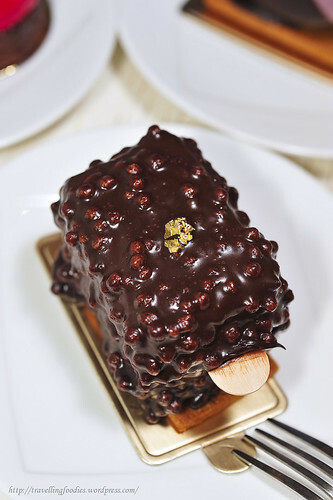 Studded with perles craquantes chocolat before being robed by a generous layer of chocolate glacage, the appearance is quite dramatic and somewhat disturbing. Well, some hits and misses in this piece. the brownie was surprisingly on the dry side, given the number of components which could potentially lend it moisture, e.g. dark chocolate mousse, chocolate glace etc. But the dark chocolate mousse can hardly be faulted. There is a missing “link” in this piece as we were informed of the use of a confiture made up of rose, lychee and raspberry. But this ispahan-like combination of flavour which ought to be really prominent against dark chocolate, was unfortunately hardly noticeable. Virtually non-descript really. I was kind of looking forward to it, only to be disappointed by its absence. 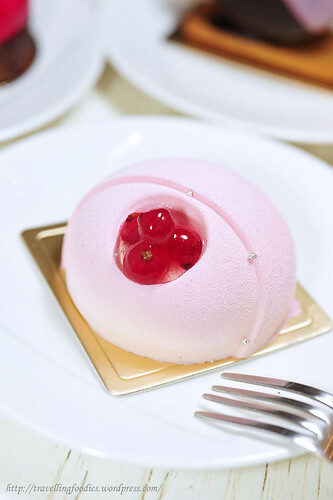 Last but not least is the elegant-looking 卡蜜拉 Carmille in alluring tones of pink and red. The flavours are also quite interesting. 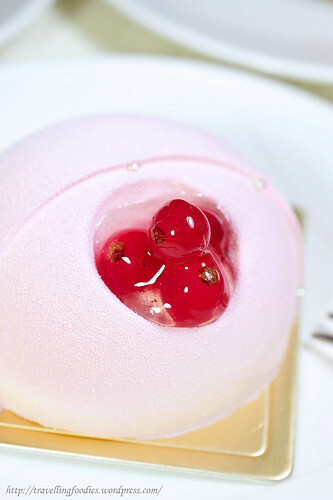 It is primarily a white chocolate and mascarpone mousse sitting over a biscuit aux joconde aux yuzu. 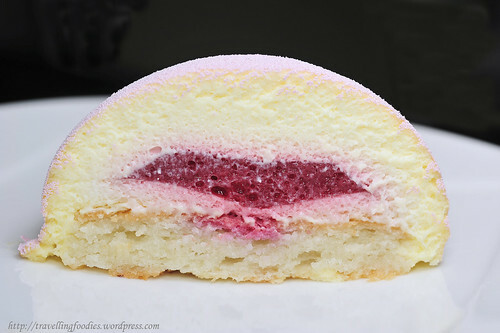 The centre is a mixed berry pâté， somewhat like the filling in Claude, but definitely its textures and flavours seemed to have been adjusted according to the more delicate flavour profile of Camille. Had just hoped that the combinations could have been more diversified in the overall selection of their desserts instead of the typical “mix and match” which some patisseries do. The aroma from the yuzu joconde sponge was quite apparent. A lovely change from the usual lemon and mascarpone pairing. last three are lavender, pistachio and chocolate infused balsamico! Can’t wait to try them again this time round! 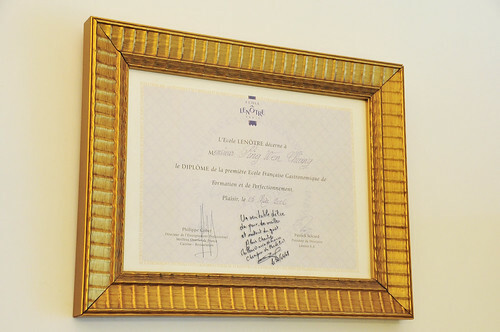 This entry was posted on November 6, 2012 by Alan (travellingfoodies). 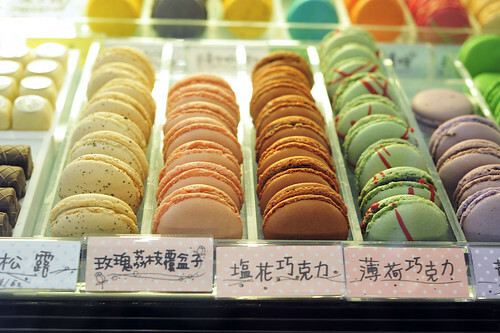 It was filed under Food, Travel and was tagged with Camille, Claude, 皇冠, 马卡龙, macaron, Patisserie La Douceur, Tahiti, Taipei, Taiwan, yongkang street, 克劳蒂, 卡蜜拉, 台北市, 品悦糖, 大安森林公园, 大溪地, 永康街, 法式甜品专卖. This place is sooo cute and my mouth waters just imagining the taste of that dark chocolate ganache pairing with tart cherry mousse, yum yum yum!! The attention to details is amazing! Hi Michelle! I think they revamp their cake selection quite frequently! I don’t recognise any of the cakes in your photos either! 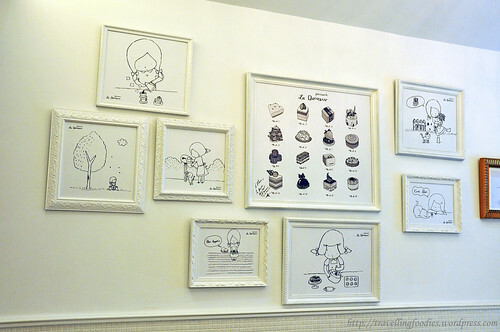 looks like you had a good time cafe hopping in yong kang street! 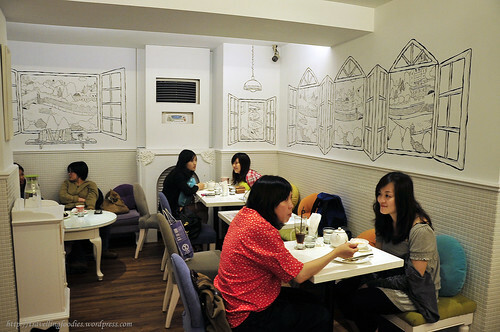 I’m gonna concentrate on two in the area, together with some beef noodle joints! 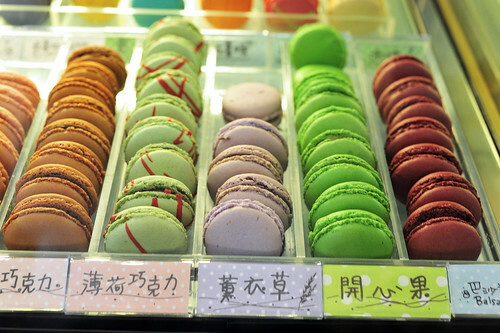 Looks pretty delicious, I’m heading to Taiwan this coming week for a working trip, will definitely head there if I have a chance!